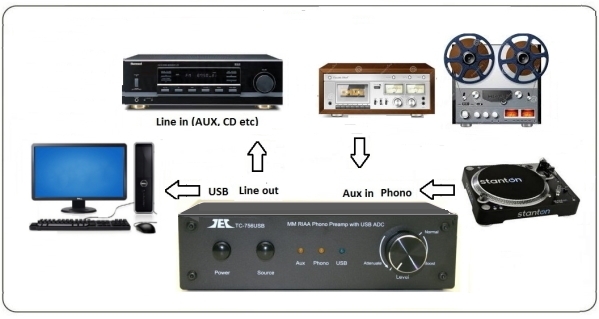 receiver or amplifier having no phono input, or to connect a second turntable to any audio system that has only one phono input. with tape decks, TV audio, and other line level sources. listening, while the RCA output with variable level attenuator allows analog audio to flow to your stereo. Works with Windows (98SE and later), Mac (OS-X) and Linux. Compatible with all MM and high output MC cartridges. Sub-sonic filter to reduce rumble and wasted amplifier power. All-steel case construction with LED power indicator, ground wire terminal. Powered by an external AC/DC power adapter to insure minimal power supply noise. Analog input and output via gold-plated RCA connectors.